Bank tellers, restaurant workers and other service employees in New York lifted credit card data from residents and foreign tourists as part of an identity theft ring that stretched to China, Europe and the Middle East and victimized thousands, authorities said Friday. In total, 111 people were arrested and more than 85 are in custody; the others are still being sought. Five separate criminal enterprises operating out of Queens were dismantled. They were hit with hundreds of charges, said Queens District Attorney Richard Brown, calling it the largest fraud case he'd ever seen in his two decades in office. "These weren't holdups at gunpoint, but the impact on victims was the same," Police Commissioner Raymond Kelly said. "They were robbed." At least three bank workers, retail employees and restaurant workers would steal credit card numbers in a process known as skimming, in which workers take information from when a card is swiped for payment and illegally sell the credit card numbers. 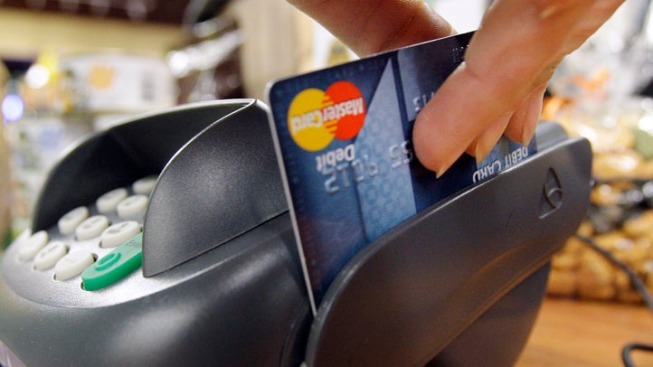 Different members of the criminal enterprise would steal card information online. The numbers were then given to teams of manufacturers, who would forge Visas, MasterCards, Discover and American Express cards. Realistic identifications were made with the stolen data. The plastic would be given to teams of criminal "shoppers" for spending sprees at higher-end stores including Apple, Bloomingdale's and Macy's. The groups would then resell the merchandise oversees to locations in China, Europe and the Middle East. All told, more than $13 million was spent on iPads, iPhones, computers, watches and fancy handbags from Gucci and Louis Vuitton, authorities said. The suspects also charged pricey hotel rooms and rented private jets and fancy cars, prosecutors said. Detectives with language skills spent hours translating Russian, Farsi and Arabic during the investigation, Kelly said. Part of the problem, especially for foreign tourists in the U.S., is that, unlike overseas, credit card companies in the U.S. do not install special microchips that make skimming more difficult, said Deputy Inspector Gregory Antonsen of the NYPD's organized theft and identity theft task force. But he said the companies work with police to help fight theft. "The credit card companies do a good job at keeping their customers happy," he said. "So if you're a victim of a loss ... you will get your money back. They also work very diligently in partnership with us providing us information that we need to investigate these cases." And, Kelly said, criminals are getting more sophisticated. "Thieves have an amazing knowledge of how to use technology," he said. "The schemes and the imagination that is developing these days are days are really mind-boggling." Authorities also say the ring operated lower-rent schemes. In one example, they tried to lift what they believed to be expensive electronics from a hangar at John F. Kennedy Airport, like something out of the movie "Goodfellas." They were stopped by police, and the loot turned out to be construction tools — the thieves had taken the wrong package by mistake, Antonsen said. Police searched several homes and seized computers, packaged electronics, and $650,000 in cash, along with several weapons. The charges include enterprise corruption, theft and grand larceny. Many of the accused members of the theft ring are being held on steep bail.